Tethering and staking out goats has a bad reputation (as you have heard). Everyone tells you not to do it. Tying out is a very useful tool when you have goats, especially if you have only a few. It lets you to put goats out to graze (or browse) exactly where you want them, and to move them to a new place only when you want them to move. This forces goats to eat what you want them to eat, and keeps them away from whatever you don’t. Tethering is the goat tied to a line that runs along another line (called, obviously, the “run line”). The run line is either staked along the ground or strung on posts over the goat’s head. Think of a dog tied by a leash to a clothesline – the dog can run up and down the clothesline, tied to it by the leash. This is the exact same idea. Don’t use a clothesline for your goats, however. 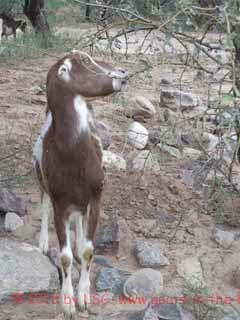 Most goats are too strong (even pygmy or miniature goats) and will pull down a clothesline. Run lines must be much stronger. Staking out is the goat tied directly to a stake, a post, or some immovable object (I have staked to a car bumper on occasion). Tying out, like chaining a dog to a doghouse, is the thing most people think of when they think about staking out goats. Trees are also the first thing people think to tie a goat to, but goats will strip the bark off the tree before they will eat the grass around it. This kills the tree. Unless you want your trees dead, don’t tie your goats to them. The equipment needed for tethering and staking out is simple. For each goat you need one or two drive-in-the-ground dog stakes and one or two dog tie-out cables. You will also need a small sledge hammer for doing the driving-into-the-ground (and pulling out later) to place the stakes. You also need a well-fitting, buckle-type nylon or leather dog collar. Don’t use a clip-type collar because the clips are not strong enough to hold a goat that is pulling on the collar. Do NOT use a “safety” collar, the kind designed to release under pressure. You don’t want the collar coming loose. That’s the point of a collar, to hold the goat. The last piece of “equipment” needed is: YOU. Goats that are tethered and staked need to be supervised AT ALL TIMES. This does not mean you have to stand there and stare at them, but it does mean you need to be around and paying attention to them. Do gardening or yard work, wash the car, play with the kids (goats or children), sit on the porch reading a book and sipping iced tea. It doesn’t matter, just be nearby and awake so you can solve any problems that come up before they turn into disasters. DO NOT go inside and watch TV, cruise the Internet (even to go on this website) or take a nap. DO NOT EVER leave your goats tied and go into town or to the neighbors. BE THERE. Your goats could need you and you wouldn’t know it. YOU are responsible for their well-being, even if you are getting work out of them, so don’t blow off your job. The big objection anyone has to tethering and staking out is that they are not "safe." The key to safety in either method, both tethering and staking out, is keeping the goat from getting tangled in the line. Goats will tangle their feet and legs, or they will ‘hang’ themselves by getting the line wrapped, twisted, or tied short to something and not being able to move (they essentially ‘tie’ themselves up short to something). To keep these from happening, take some easy precautions. To start with, you need to look at the area where you are going to tether or stake out the goat. You want your goats where they are going to eat the brush you want cut, of course. But you also need to be thinking about sun and shade, traffic which might frighten the goat (and make them run to the end of the line, choking themselves), other animals especially dogs (who might frighten or, God forbid, maul them), and children (yours do not harass your goats, I hope, but other peoples’ children might). Then also look at the plants in reach of the goat. Is there anything they can reach that you don’t want eaten? Anything that might hurt them? Any poisonous plants? Any that are worth more than the goat? Place the tether run line either very low to the ground (as close to the ground as you can get it, while still letting the goat’s line move freely along it) or high enough off the ground that the goat can’t reach it even if she’s standing on her back legs. Use stakes for putting it along the ground, driving them so that they slightly lean away from each other. Use hooks or wrap the cable around posts and clip it to itself if making a high-line. Just make sure the line can't slip down from where you put it. Keep the tether run line very, very taut. Tie or stake the run line so that it is as tight between the posts as possible. The idea is to keep the ground run line from having any slack in it so the goat can’t get a loop in it (which will, of course, end up around a hoof or leg), or the overhead run line from sagging down to where the goat can reach it. This keeps tangles to a minimum and also lets the goat’s line run up and down it smoothly. Then, clip the goat's line to the run line, stretch it out its full length and walk it up and down both sides of the run line. Drive the stake where you think you want it, clip the cable to the stake, then unroll the line to its full length. Walk in a complete circle around the stake at the end of the cable. Walking at the end of the cable, either on a tether run line, or around the stake, you are checking the "sweep area" of the goat's line -- are there any hazards? Look to see if there is ANYTHING the line could wrap around. Don’t look for just the obvious (trees, lawn furniture, the children's toys, etc.) but look for the hidden line-snaggers (lawn sprinkler heads are the most common; also rocks, garden gnomes, tree roots, etc.). If you are tying out more than one goat at the same time, make sure they are far enough apart they can't tangle with each other. If you find any hazards, either move them (furniture, toys) or move the tether or stake. Still keep in mind the sun/shade situation (do I need to say it -- don't make your goat stand in the full sun, make sure there is some shade for when she gets too hot). When you have checked the tether or stake area and cleared it of all hazards you are -- almost -- ready to tie out your goat. You will need to teach your goat(s) to tie before tethering or staking them out for the first time. Goats are not born knowing about tethering and staking out. They need to learn what it feels like to not be able to go just anywhere they like. They need to get familiar with “running to the end of a leash” so they don’t panic and hurt themselves. For my best ideas on how to teach goats to tie, click here. Ready to Tie Out Your Goat? You need a sturdy collar, preferably a buckle-type (NOT a “safety collar” – the kind that pops open when enough pressure is applied) and put it on the goat. It should be snug enough to only fit two or three fingers under the collar when it is buckled UNLESS your goat is a LaMancha (with "no ears") in which case the collar should fit snugly along the neck. Make it just loose enough the goat can still swallow, but no looser. Take the cable (whether you are tethering or staking out) and WRAP it around the goat’s neck ONCE, clipping the snap BOTH back to the cable itself AND to the ring in the goat’s collar. This makes a loop of line AROUND the goat’s neck that can tighten like a noose, but can only tighten so far before being stopped by the collar. Looping the line and then clipping it back to itself and to the collar ties the goat TWICE to the line. The ‘noose’ will only be activated if the main collar breaks, comes loose, or falls off the goat (yes, this happens). This is just a safety catch to keep the goat from getting loose. DO NOT EVER TIE A GOAT WITH JUST A NOOSE. The noose also serves the purpose of keeping the goat from ‘leaning’ on the collar until either the collar breaks, or the line pulls the tether loose. Again, this is just a safety technique, NOT EVER the main way for tethering and staking out a goat. This end of the line (even though it is making a ‘noose’) still needs to have a swivel snap. The swivel makes it easier to make the loop, and also keeps the goat from tangling the loop and the collar together (yes, this can happen, too – never underestimate the stupidity of a goat). Now you are ready to tie out your goat. Limit the amount of time you leave your goats tethered or staked out. Most goats do not really like being tied out. Tying limits their movement (goats are very independent-minded) and it also goes against their natural browsing instincts. If left loose, goats will wander around nibbling on various plants. Tethering and staking out makes them stay in place. Leave your goats out for half an hour when you first start tethering or staking them. Work up to no more than two hours per day.This also helps you keep shade available. Make sure to let them drink as soon as they are back in their pen. Skritch 'em and tell 'em they did a good job! Nothing in this life is perfect, safe, or perfectly safe. Goats are stupid. So are people. If you have goats, they are your responsibility. If you use my ideas, and something bad happens, that is life. If you think my ideas are full of goat berries, don't use them. Make your own decisions, assess your own risk, and live your own life. Me? I tether and stake out my goats. Information on this site is intended for educational purposes only. It is not intended to replace the advice of a veterinarian. Seek the advice of a licensed veterinarian for all goat health care concerns.